Golden and spinach rippled pasta in a parmesan cream sauce. A deliciously seasoned pasta side dish that is quick and easy to prepare. 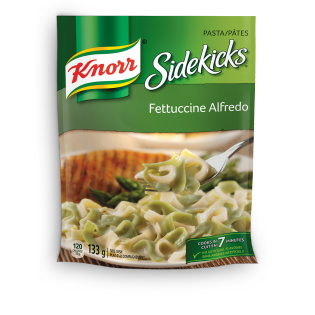 Sidekicks are perfect as an ingredient in a delicious Knorr recipe or as a side. Wheat pasta, spinach noodles (durum semolina, dehydrated spinach), modified milk ingredients, natural flavour, corn syrup solids, salt, dehydrated parmesan and romano cheeses, sodium phosphate, monosodium glutamate, sunflower oil, maltodextrin, corn starch, garlic powder, dextrose, monoglycerides, tocopherol, spices, soy lecithin and sulphites. In a 6 cup (1.5 L) microwave-safe casserole, bring water to a boil (HIGH 5-7 minutes). Gradually stir in package contents. Microwave uncovered 6-8 minutes,* stirring once. Stir in margarine, cover and let stand 3 to 5 minutes. Sauce will thicken upon standing. *Microwave ovens vary; adjust times as needed.